Located just 20 minutes south of Tupelo and an hour and a half drive from Memphis, Okolona offers an ideal small town atmosphere with friendly people, affordable living, quiet neighborhoods, and a community environment enriched with history and culture. College records for the Okolona College are now kept at Voorhees College in Denmark, South Carolina. Their website is www.voorhees.edu or you can call 803-703-7119 for the records department and talk to Andrea Collins, their transcript coordinator. In February 1914, Mr. A.T. Stovall, a prominent Okolona attorney, wrote to the Carnegie Corporation requesting funds to build a library building in Okolona. The city of Okolona purchased the lot on Main Street for $4,000. The Carnegie Corporation agreed to furnish $7,500 to construct the library building. The City Council of Okolona agreed to provide no less than $4,750 a year to support the library. The architect was John Gaisford of Memphis. When completed in May of 1915, the library consisted of one large room and a full basement. The basement, which is uncommon in this area, has four small rooms and two baths. At one time the library grounds included a small park with a wading pool. In the fall of 1977, the Okolona Carnegie Library became part of the Dixie Regional System. The new addition was completed in October 1986 and increased shelf space by 300% as well as providing a spacious conference room. Located on Main Street in Okolona in front of the Carnegie Library, is the Story Labyrinth. The Labyrinth Project was begun as a part of a Key Arts Grant given to the town through the Chamber of Commerce for the purpose of collecting stories from the elders in the community and telling them to the children. A portion of the grant money was allotted for a visual monument/document of the event. Patsy Gregory, the Director of the Okolona Area Chamber of Commerce, met with town leaders and faculty from Mississippi State to discuss concepts and ideas for the piece. The group felt it important to document not only the stories, but the meaning of the project. The labyrinth seemed to depict metaphorically the project's intentions. The labyrinth has been used for hundreds of years as a tool for concentration, meditation, and purification. There seems to be something eternal about the path. Though it has an end, it does not provide choices. Movement along the path involves concentration on the path, rather that the decision of one person. The Story Telling was important for the community on many levels. It was a chance to bring together young and old, black and white by comparing the past and the future; providing an opportunity for the townspeople to meditate, through the act of sharing, on the history of the town. Two professional storytellers collected memories from the elders in the community. The stories were catalogued and told to the children on three Storytelling occasions at the Carnegie Library. "Dylan" and "Wes", a couple Okolona residents, worked with the children at these events to attempt to produce drawings related to the stories. The children's drawings depict the stories in a very different level than a traditional rendering would. The drawings vary significantly with the age of the children, thus the stories are told in very different ways. It would be easy enough for an 'artist' to produce a rendering of the old man who used to live in a well in the town, or the man who went crazy and rode down Main Street on a horse shooting into the air, but these renderings would be no better representations than the stories themselves. In fact, the artist would have to add fictional information to the drawings in order to make them 'understandable.' The second grader's cowboy or the preschooler's blob is not necessarily 'accurate' but is a wonderfully honest portrayal of their particular understanding of the story. Their drawings, combined with the documented stories, provide a valuable landmark in the history of the town. Dylan and Wes, working for the Small Town Center at MSU, were involved in making the final portion of the project which became the Story Labyrinth in front of the Carnegie Library. Shannon Criss, John Poros, and Nils Gore from the STC, and Robert Long, a ceramics professor in the Art Department worked with us in the design stage. Shannon, and daughter Ella, helped pour and finish concrete. The labyrinth is intended to be a spot for meditation within the city as well as a monument to the story telling project. It contains the children's drawings and provides benches for meditation. The site is also the location of the Okolona "Christmas Tree of Memories." The Labyrinth project provides a stand for the large tree as well as electrical outlets for the tree's lights. The project will hopefully be seen by the community as a landmark of not only something that happened in the past, but of a positive step taken by the townspeople towards an openness concerning the town's history and the possibility of a united future. Take a tour of the historical homes in Okolona! Stop by the Chamber and pick up "A Driving Tour of Historic Homes" and discover the history of many homes from the 19th century and early 20th century. There are 200 buildings and homes with local significance within this district. You might also like to get one of the HISTORY OF OKOLONA books that may be purchased from the Chamber office for $20. 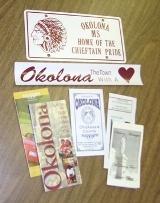 There are also booklets with stories of Okolona by some of the residents that can be purchased for $5. Okolona's Civil War history includes the scene of a Confederate division hospital and three major Union raids. Okolona native Col. James Gordon organized, armed, and equipped at his own expense, about $32,000, the first company of cavalry that went to fight in the war from the state of Mississippi. 1. Union forces, according to published reports, attacked Okolona in December, 1862, while the town was under the command of Col. C.R. Barteau, who was wounded in the conflict. 2. Again on February 22, 1864, Union armies attacked the town in one of the area's most fierce raids. The hospital, which had been established at Rose Gates College, a women's school, as well as a 100,000 bushel corn supply stored in a railroad depot were destroyed. Maj. Gen. W. Sooey Smith was scheduled to meet Maj. Gen. William T. Sherman in Meridian, MS with 7,000 cavalry. Smith and his powerful mounted corps on their foray deep in to Mississippi were fated to meet Maj. Gen. Nathan Bedford Forrest and his 2,500 "critter" cavalrymen. Although the Yanks outnumbered the Rebs almost three to one, Forrest, a physically powerful man, knew that war meant fighting and fighting meant killing: a philosophy that made him a terrible enemy. In the running engagement, Forrest demonstrated these qualities of leadership as he and his men put the skeer on Sobey Smith and his corps. In the ensuing desperate fighting, Col. Jeffrey Forrest, Maj. Gen. Nathan Bedford Forrest's brother, was shot through the neck and fell mortally wounded. There were charges and counter- charges before the Federals disengaged, abandoning a cannon. Discouraged and beaten, Sooey Smith's once proud corps hurried on to Memphis. A Union brigade commander best-summed up Forrest's accomplishments: The retreat to Memphis was a weary, disheartening, and almost panic- stricken flight, in the greatest disorder and confusion, and through a most difficult country. The first Brigade reached its camping- ground five days after the engagement, with the loss of all its heart and spirit, and nearly fifteen hundred fine cavalry horses. The expedition filled every man connected with it with burning shame, and it gave Forrest one of the most glorious achievement of his career. 3. The last raid came in the waning days of the War Between the States when every store in the town was burned in a January 1865 attack. "Northeast Mississippi's largest Confederate Cemetery"
"In 1862 the Okolona College building known as Rose Gates College, was taken by the Confederate government as a hospital. It was a three-story building with about a dozen rude wards surrounding it. The Presbyterian Church was also used for the same purpose, and a number of soldiers were cared for in private homes. "While the Confederate Army was operating in Tennessee and Northeast Mississippi, the sick of the army was sent to the hospital at this place, as were the wounded from the battles of Shiloh, Corinth and Brice's Cross Roads. 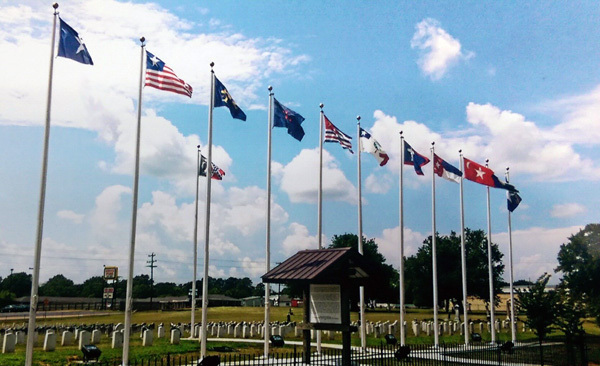 These soldiers were principally from Alabama, Arkansas, Georgia, Florida, Kentucky, Louisiana, Missouri, Mississippi, South Carolina, Tennessee and Texas. Located in northeastern Mississippi, it is a state park named for the Tombigbee River nearby. Tombigbee National Forest Campgrounds has more information on its history and attractions. 27,319 Acres of protected wildlife available to the public for hunting. This area provides abundant opportunities for hunting and other recreational activities. Deer, turkeys, squirrels, rabbits, quail, dove, raccoons, opossum, bobcats, beavers, wild hogs and coyotes abound. The Chickasaw Wildlife Management Area is reminiscent of what Native Americans and early settlers must have experienced. For more information call 662-447-0141 or visit U.S. Fish & Wildlife Service - Chickasaw National Wildlife. Adjacent to the Natchez Trace Parkway at mile-marker 243, Davis Lake offers a retreat from the hectic, hurry-up pace of everyday life. Nature trails provide a tranquil escape for hikers to experience the full beauty of the area. Shaded camp sites, complete with electrical and water hookups, have modern convenience without hassles. Swimming, boating and fishing are also available. Originally a series of hunter and Indian paths leading northward from the Mississippi River to the valleys of Tennessee, the Natchez Trace has been developed into a modern two-lane parkway by the National Park Service. Today, the Natchez Trace Parkway traverses Chickasaw County, closely following the original course. Visitors from across the country visit the Parkway annually. Although the methods of travel vary with each visitor, many elect to bicycle the entire Parkway, taking full advantage of the natural beauty of the route. Special trails for horseback riding are also available. The Hernando DeSoto, Witch Dance, Bynum Mounds and Chickasaw Agency scenic overlooks provide vistas reminiscent of what Native Americans and early settlers must have seen on the original trace. Check this link to Explore the Natchez Trace. Held during the first quarter of each new year at the Mississippi National Guard Armory. This evening brings more than 250 members and guests together to honor those who have made a special contribution to the area. For more information, please call the Chamber office at 662-447-5913. Okolona has an Annual Christmas Parade usually set on a weekday at 7:00pm during the first week of December. The parade routes beginning at Okolona Elementary School. Bands line up on Main Street at Okolona Elementary School. Cars will line up on Prairie Street, and floats line up on School Street. Each year's Christmas Parade has a theme to be determined. The Parade is viewed along Main Street. Anyone wishing to enter the parade would need to fill out an application. Prizes are awarded to the group that sponsors the best float. It is the desire of the Okolona Area Chamber of Commerce to have a wholesome family-oriented event and the Okolona Area Chamber of Commerce Board of Directors reserves the right to decline participation to any person or groups that use inappropriate materials or slogans. For more information, please call the Okolona Area Chamber of Commerce, sponsor of the Christmas Parade, at 447-5913. 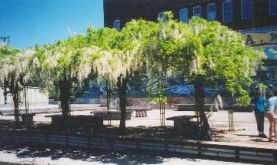 The Magnolia Festival is a major event sponsored by the city of Okolona. The festival takes place on Main Street each year, during the last weekend of July.